Although US and Japanese tank forces first clashed in 1941, it was on in 1944 that tank-vs-tank action became more common as both sides poured larger numbers of tanks into the combat zone. These battles were a means of demonstrating each side's latest tank technology. For the US, the pinnacle of their tank machinery came in the form of the M4 Sherman and for the Japanese, their most notable feat o… f engineering was the smaller, yet still effective Type 97 Chi-Ha. The last two campaigns of the war Iwo Jima and Okinawa saw tanks used by both sides, the Japanese finally concluding that the fight against the US Army is a fight against his M4 tanks . 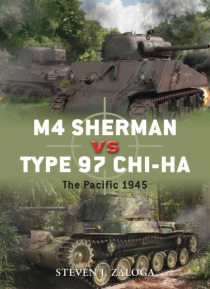 The illustrations follow the usual Duel pattern with profile illustrations of the Type 97-kai Shinhoto Chi-ha and the M4A3, views showing the ammunition of both types, interior illustrations showing the turret layout in both types, and a battlescene showing the Type 97-kai in combat against US armour.